Practical Operational Due Diligence on Hedge Funds is an encyclopaedic, comprehensive reference, written from the perspective of an experienced practitioner. Accompanied by a useful archive of factual material on different hedge fund issues, including failures, fines, and closures, this book focuses on the areas due diligence professionals should address, and explains why they're important. Extensive discussion of publicised cases identifies the manager entities and actual fund vehicles involved, and provides commentary on what could have been done differently in each case, backed by actual regulatory materials, such as SEC complaints, that recreate the events that took place. Readers gain a deeper understanding of the many facets of due diligence and the many possible pitfalls, learning how standardise processes and avoid major errors and oversights. The amount of money managed by hedge funds has almost doubled from the $1 trillion under management at the time of the financial crisis. Hedge funds can be extremely risky, but can be extremely profitable — as money increasingly flows back in, due diligence on these alternative investments becomes more and more critical. This book provides complete guidance toward the due diligence process, with plentiful real-world examples. Proper due diligence can be a massive undertaking, but thoroughness is essential when the price of failure is so high. 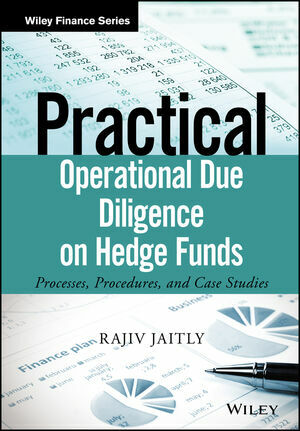 Practical Operational Due Diligence on Hedge Funds provides the details professionals need to be on point every time. RAJIV JAITLY is the managing partner at Jaitly LLP, a risk consultancy that provides independent risk, fund governance and operational due diligence services to global alternative investment clients. He set up and managed due diligence and investment management operations for the alternative investment asset businesses of major companies such as UBS, Santander and AXA. Jaitly has also advised the Regulatory Policy team of the U.K. Pensions Regulator, was appointed an expert by the UK Office of Fair Trading for its market study into the UK defined contributions pensions market and was commissioned by the UK Financial Services Consumer Panel to write a report on Fund Costs and their implications. He has also held appointments as a non-executive director of funds.